I had someone ask me last week when she should pick her brussels sprouts. Most experienced gardeners will tell you that Brussels sprouts are best after a hard freeze, and that is certainly true. Cool temperatures help the sprouts develop a complex flavor with more sweet notes and less bitterness. We’ve had a hard freeze a few weeks ago — the one that put an end to the gardening season. That was probably enough to start improving the flavor. 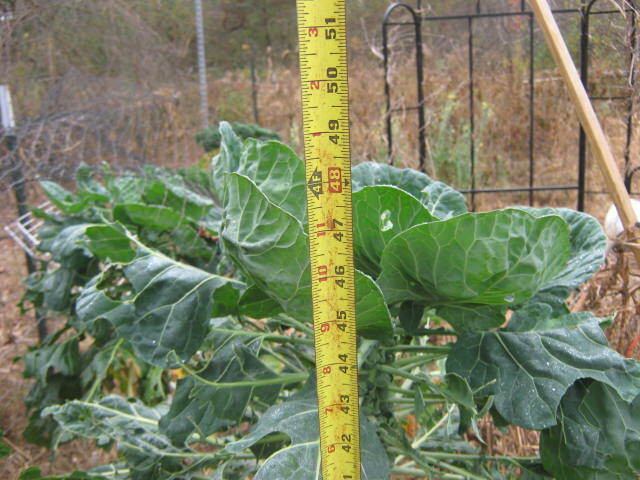 Brussels sprouts can tolerate fairly cold temperatures. Many years, I’ve been able to leave the plants out in the garden at least until Thanksgiving and during strong El Nino years, until Christmas. The cool damp growing season this year was not good for tomatoes and peppers but was perfect for brussels sprouts. Ours are nearly four feet high. Since a strong El Nino has developed,we most likely will have one of those seasons where brussels sprouts can be left out in the garden well after Thanksgiving. This is important if you want to get the absolute best tasting brussels sprouts possible. Brussels sprouts start losing their flavor just three days after picking. On the other hand, the flavor keeps improving as long as the sprouts stay on the plant. So you can see the advantage of leaving the sprouts on the plants until you are ready to cook them. There are millions of people who will never eat brussels sprouts because they were forced to eat them when they were a child. They wonder why they were ever invented in the first place. At one time, brussels sprouts were always picked by hand and those old commercial varieties tasted halfway decent. Then in the 1970′s and 80′s machines were engineered to harvest the sprouts. That meant physical changes had to be made to the brussels sprout plant itself in order to accommodate machine harvesting. In the rush to breed machine harvest-able plants, the cost came down drastically but the flavor was lost in the process. They became strong-flavored and bitter. Things have changed in the past 20 years or so. Big improvements have been made by plant breeders to improve the taste of brussels sprouts, they’ve gained back the flavor that was lost during the early years of mechanization. It may be time to re-try brussels sprouts if you haven’t tasted them since you became an adult and now make your own food decisions. Pick brussels sprouts by snapping them off the plant with a twist. Remove the outer layer of leaves. Some gardeners dig up the whole plant and save the sprouts on the stalk to pick off later. The best way to cook brussels sprouts is to steam them until they are tender enough to be pierced by a fork, about 7-14 minutes. Some people cut a small “x” in the bottom of each stem to help them cook more evenly. Overcooked sprouts turn mushy and loose flavor and nutrients. I plan to leave my plants in the garden as long as possible this season. And when very cold weather finally arrives, I’ll pick the remaining sprouts, blanch them and store them in the freezer.